everWhew! We had a heck of a summer, and Cabo really took a hit from Odile… it was a test of everything and everybody here at the cape on a biblical scale. I am still impressed on a daily basis with the resilience and strength of our community, putting our lives and our town back together better than before the storm. My kitchen has a brand new roof with solid metal structure welded into the framework of the house. I lost my old roof because the antique wooden framing couldn’t take the strain, and I figured it would be junk once the guys got it down–it turned out to be in amazingly good condition, and wound up building a good (and very pretty) stretch of fence! We did the first week of classes in my downstairs kitchen out of an icebox. It reminded me of the old days in Cabo when I lived off the grid with solar panels and water was delivered by pump truck. I will always have a special place in my heart and kitchen for those first groups of cooks who came back to Cabo regardless of conditions so soon after the storm. I think we were all pleasantly amazed how quickly things came back together. So the roof is on, and we are back to cooking upstairs. The inaugural week was magical. I do not have a schedule. 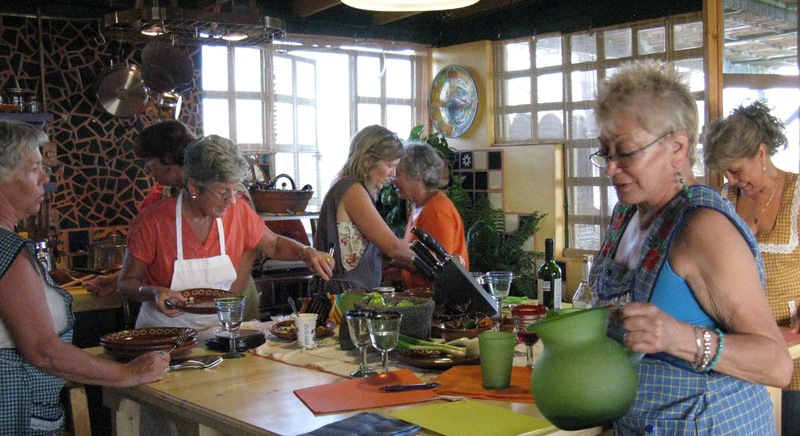 The first cooks to reserve a class choose the subject, and for the first time in six years of classes, every single class that first week turned out to be… making mole! My favorite! I love my kitchen, and all the cooks who show up to cook, more than ever before. Thanks to all of you for your fine sense of adventure and love of traditional Mexican food and culture that brings you to Cabo and into my home and kitchen! I look forward to cooking with you soon.